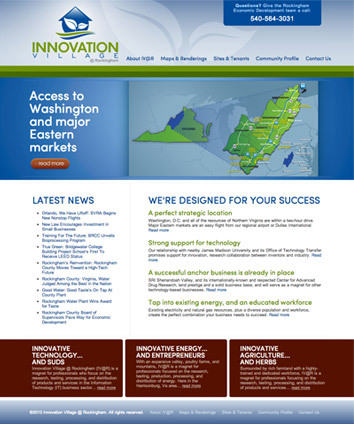 We recently worked with the Rockingham County Office of Economic Development and Tourism to develop a new website for Innovation Village at Rockingham (IV@R), a research and technology park in the Harrisonburg, Virginia Metropolitan area. The website can be viewed at: www.ivatr.com. 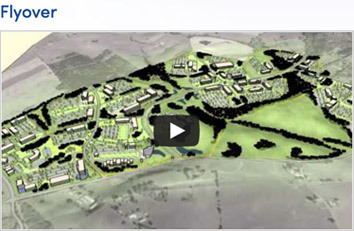 IV@R is a 365-acre, Class A master planned village located along the I-81 corridor. In addition to office, laboratory, and light manufacturing spaces, the development will include flexible, multi-use buildings, walking trails, picnic areas, and a venue for concerts and events. Rockingham County's vision is that IV@R will become the region’s premier high-tech and biotech hub. In order to market the park more aggressively, the Economic Development team decided to create a standalone website for IV@R. Previously, information about IV@R was housed on a single page on the Economic Development website. We worked closely with the County to develop a website that's not only information-packed, but also has visual impact; is highly interactive; and provides a seamless experience on a range of devices. IV@R’s online presence has expanded from a one-page “teaser” to a multi-page experience. Site selection consultants, business owners, and other parties now have access to a wealth of information and resources about transportation, utilities, permitting, taxes, incentives, demographics, education and workforce training, labor statistics, and quality of life. Various data reports and publications may be downloaded directly from the website. Website visitors can see IV@R as it stands “today”, and they can see IV@R's future. A master plan and other supporting maps are provided, and help show the long-range vision for the tech park. There is also photography of The Village and SRI Shenandoah Valley. The website includes an interactive “flyover" as well, which takes visitors on a virtual tour of the three development phases that are planned. It is very easy for prospects to find information on available property and business opportunities, with the inclusion of a “Sites & Tenants” hub on the website. This section is a one-stop resource for critical site selection information, such as available sites and site specs and target industries. Members of the Economic Development team can update the new website through a user-friendly, web-based content management system (CMS). The CMS lets staff update the site at their convenience, totally in-house, ensuring that important updates about IV@R can be published easily, and in a timely manner. Copyright 2005-2015 Whittington Consulting LLC. All rights reserved.